Do you have favorite movies you liked when you were a child? Have you watched these movies with your kids? It will be fun to watch these old throwback movies again, together with your kids. They will bring back memories that let you relive your childhood. Sharing them with your kids will give kids a glimpse into what you were like as a kid yourself. As we use Netflix more and more, I am glad to see there are some old movies and TV Shows on Netflix. Here are some of them. Below each title is linked to Amazon, with additional links to Netflix and iTunes. Some links are affiliate links, meaning if you use the link iGameMom will receive a small percentage rebate, but the cost to you doesn’t change. Thanks for supporting iGameMom by using our links. Inspector Gadget: Relive the adventures of everyone’s favorite and much beloved bumbling detective. Watch as the Inspector takes on M.A.D and the evil Dr. Claw with his arsenal of backfiring gadgets. As the world’s only semi-robotic policeman, he’s his own worst enemy but with Penny and Brain in his corner, Inspector Gadget can never go wrong! On Netflix and iTunes. Danger Mouse: A spoof of Sherlock Holmes and James Bond, this Cosgrove Hall animated series follows the adventures of DANGER MOUSE, a London-based, eye patch-wearing, secret-agent mouse who regularly saves the world from monsters, master thieves, and other evildoers. One of the few British children’s series to succeed in America, DANGER MOUSE is perfect for children of all ages. The series aired from 1981-1992 on ITV in the U.K. and in the 1990s on Nickelodeon in the U.S. On Netflix. The Little Pony Friendship is Magic: Join Twilight Sparkle as she sets off on her assignment to learn the true meaning and value of friendship through her crazy, laughter-filled adventures with the other ponies of Ponyville; Apple Jack, Rainbow Dash, Fluttershy, Pinkie Pie, and Rarity! On Netflix and iTunes. Spiderman and His Amazing Friends: Joined by his friends Firestar and Iceman, the amazing Spider-Man swings into battle against New York City’s most dangerous villains. On Netflix and iTunes. Star Wars The Clone Wars: Follow the animated adventures of the Jedi knights, including Anakin Skywalker and his master, Obi-Wan Kenobi, as they battle the galaxy’s enemies. On Netflix and iTunes. Mighty Morphin Power Rangers: Five average teens are chosen by an intergalactic wizard to become the Power Rangers, who must use their new powers to fight the evil Rita Repulsa. On Netflix and iTunes. 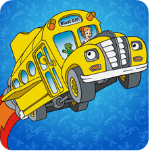 The Magic School Bus: Join Ms. Frizzle as the Magic School Bus travels to outer space, under the sea, through an anthill – and even inside the human body. On Netflix and iTunes. The Cat in the Hat Knows A Lot About That: The Cat in the Hat is teaching Sally and her brother Nick some awfully nifty things to think about. On Netflix and iTunes. Garfield and Friends: Everyone’s favorite feline, Garfield, dispenses sarcastic witticisms in this assortment of animated adventures he has with owner Jon and dog Odie. On Netflix and iTunes. The Super Mario Bros. Super Show! : Mixing live action and animation, this classic series brought the beloved Super Mario Bros. video game characters to television screens everywhere. On Netflix and iTunes. The Smurfs: When the evil wizard Gargamel chases the tiny blue Smurfs out of their village, they tumble from their magical world and into ours — in fact, smack dab in the middle of Central Park. Just three apples high and stuck in the Big Apple, the Smurfs must find a way to get back to their village before Gargamel tracks them down. On Netflix on iTunes. Scooby-Doo: Mystery Incorporated: A sleepy little village, Crystal Cove boasts a long history of ghost sightings, poltergeists, demon possessions, phantoms and other paranormal occurrences. The renowned sleuthing team of Fred, Daphne, Velma, Shaggy and Scooby-Doo prove all of this simply isn’t real, and along the way, uncover a larger, season-long mystery that will change everything. On Netflix and iTunes. 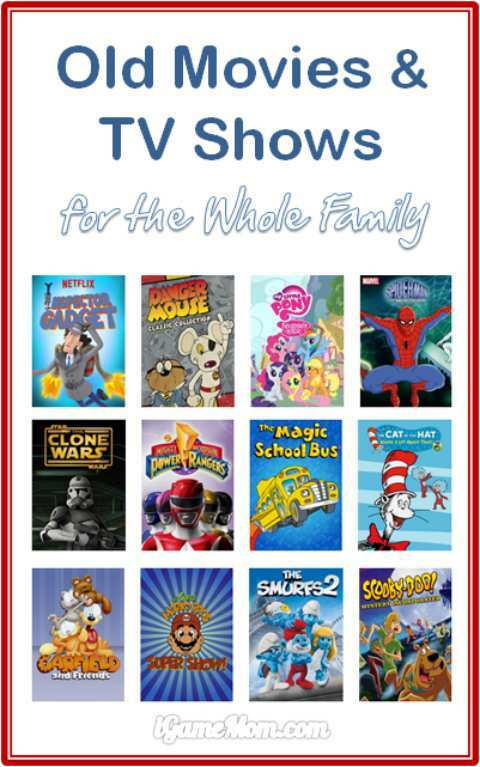 For more movie ideas for the family, please visit our Educational Movies for Kids collection.